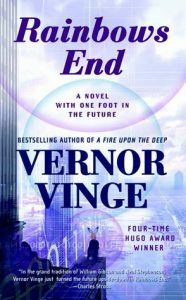 The post Top 10 San Diego Books (Part Two) appeared first on Joe Yogerst. 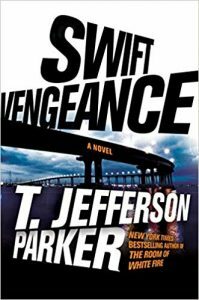 The post Top 10 San Diego Books (Part One) appeared first on Joe Yogerst. And my picks for the best San Diego books published between 1884 and 1981 are . . . . Published in 1884, Jackson’s landmark book was written in a New York City hotel room upon her return to the East from a long Southern California sojourn. It brought the region’s multicultural heritage to life and helped illuminate the plight of Native Americans in the West. And it’s definitely one of the books that my characters in Nemesis would have read. 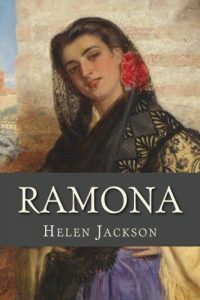 The city of Ramona in San Diego County allegedly owes its name to the novel’s popularity. Flush on profits from The Wonderful Wizard of Oz (published in 1990), Baum began wintering in Coronado in 1904, living with his family at the Hotel Del or various rented houses along the beach. 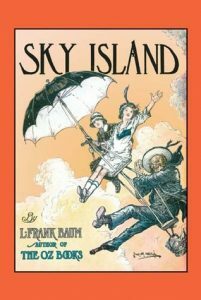 San Diego’s seaside environment had a profound impact on several of his books, in particular The Sea Fairies (1911), Sky Island (1912), and The Scarecrow of Oz (1915), all of which are set in locations reminiscent of the Southern California coast. Geisel was already a well-established cartoonist, screenwriter and children’s author when he and his wife moved to La Jolla after World War Two. But the books he would write during his San Diego years would make him an American legend, among them The Cat in the Hat (1957), How the Grinch Stole Christmas! (1957), Green Eggs and Ham (1960) and One Fish, Two Fish, Red Fish, Blue Fish (1960). It’s always intrigued me that “Dr Seuss” was writing and illustrating these books at his house in La Jolla while I was growing up in nearby Pacific Beach. Sixty years separate the Wizard of Oz and Coronado’s next great literary turn. Originally called Bid Time Return, Matheson’s 1975 science fiction classic revolves around an ailing screenwriter who becomes obsessed with a photograph of an 1890’s actress while he’s convalescing at the Hotel Del. 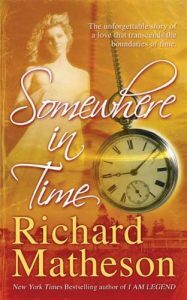 He figures out a way to travel back in time to meet and court the actress, although the reader is never sure if the journey (and love affair) is a product of his cancer-stricken mind or really happened. 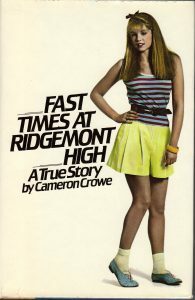 Not the teenage passage movie, but the 1981 book that inspired the celebrated Amy Heckerling film. Crowe graduated from San Diego’s University High School the year before me — we were both writers on the El Cid student newspaper. But most of the anecdotes and characters in Fast Times are drawn from his stint as an “undercover student” at Clairemont High, where my cousins went to school. The post The birth of a murder mystery appeared first on Joe Yogerst. It all started in Borneo . . .
What was your inspiration for NEMESIS? What appealed to you about this story? Believe it or not, my inspiration happened during a trip to Borneo. I got sick fron1eating something I probably shouldn’t have, and spent several days recovering in a ren1ote jungle lodge at the base of Mt Kinabalu. The guy I was traveling with gave me a book to read while he clin1bed the mountain – Black Dahlia by Jan1es Ellroy. I couldn’t put it down, had the book finished by the time my friend was back down the mountain. And I ren1ember telling n1y friend that I wanted to write a book like that – a n1urder mystery that reflected the politics, culture and history of a particular city in ways rarely seen before. 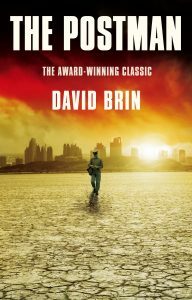 road, I read The Alienist by Caleb Carr. Fell head over heals for that book, too. I actually got to interview Carr for a magazine story I was writing on the world’s n1ost significant battles (he’s an avid military historian). 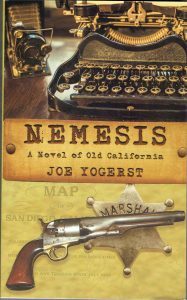 And that book was highly influential in having me set NEMESIS in 1880s San Diego rather than contemporary tin1es. What is your writing process? How long did it take you to write NEMESIS? Whether I’m writing journalism or fiction, my writing process is pretty much the same. I only write Mon­ day to Friday, reserving weekends for family and friends – unless, of course, I have a pressing deadline. During weekdays I’m generally at n1y desk – and banging away at the keyboard by 8:30 or 9 o’clock. I take a very short break for lunch and then write again until around two or three in the afternoon. The rest of the day is set aside for exercise, short naps, correspondence, or researching what I have to write the following day. it took a number of years. Let’s just leave it at that! What should readers know about you? 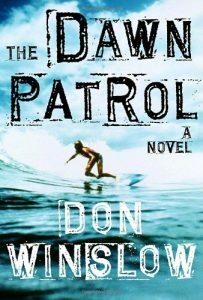 It’s important to know that I was born and raised in San Diego – in a seaside suburb called Pacific Beach. I’ve lived here for two-thirds of my life. But because my n1other was from Arizona, I grew up in a household filled with country music, cowboy shows on TV, and classic Western movies. I’ve had fictional stories swirling around inside my head since I was a kid. I used to listen to records in my boyhood bedroom and make up whole n1ovies to go with the songs – kind of like what ABBA did with their songs decades later. I got sidetracked into journalism, rather than fiction or creative writing, =in high school prin1arily because my school had a great student newspaper, El Cid, and a great faculty moderator, Danny Wilson, who inspired us to write at a time when it was very cool to be a journalist (Watergate era). I didn’t really think about writing fiction until n1uch later in life – but I never stopped making up plots, characters and stories in my head. And there are still hundreds of them swirling around in there. 13 years overseas in total before moving back to San Diego. 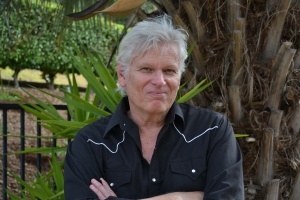 The post Nemesis by Joe Yogerst’s published October 30 appeared first on Joe Yogerst. 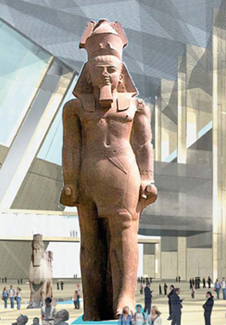 The post Eternal Egypt: King Tut Rediscovered appeared first on Joe Yogerst. The post Making Porsche Dreams Come True appeared first on Joe Yogerst. Johnny Kanavas (left) and the author. It’s grand prix week in Los Angeles. But rather than watching the Indy cars zoom around the street course along the Long Beach waterfront, I’m up the road in Carson, behind the wheel of a Porsche 911 Carrera S hitting speeds approaching a hundred miles per hour. Not on the 405 freeway, mind you (although how I wish). But on the road track of the new Porsche Experience Center. 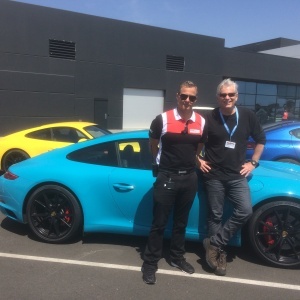 Riding shotgun is chief instructor and veteran Porsche driver Johnny Kanavas. “Break hard!” he shouts as I approach a series of S-bends at a speed that would surely get me ticketed on a public street. And before I’m even through the first bend he’s shouting. “Punch it! Hit the gas!” as we accelerate between the bends and out onto a straightaway. Opened last November, the Porsche complex sprawls across what was once a golf course at the junction of the Harbor and San Diego freeways. One of only five similar centers scattered around the planet, the 53-acre site includes the aforementioned road circuit, a see-how-fast-you-can-go drag strip, hilly off-road course to test four-wheel drive capabilities, and three areas to learn and perfect safe driving on slick surfaces. Away from the track, the center is also the new home to Porsche Motorsport North America, the place where Porsche’s technicians, engineers and mechanics prep vehicles for races like the 24 Hours of Daytona, 12 Hours of Sebring and the professional sports car events during Long Beach race week. 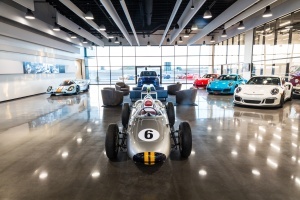 Visitors can watch action in the garage through big picture windows on one side of the center’s atrium, which displays vintage race cars rotated in from the Porsche Museum in Stuttgart, Germany. And that’s not all. In order to make the center a full day experience, there’s also a gift shop with all sorts of Porsche gear, a tasty little track-side cafe (the chocolate croissants — flown in daily from Paris — are to die for) and an upstairs gourmet eatery called Restaurant 917 which features the modern California cuisine of executive chef Matt Lee, former food maestro at the Getty Center. But it’s really about the driving, a chance to crawl behind the wheel of a 718 Boxster, Panamera GTS, Cayenne Turbo S, Cayman GT4 or one of the 19 Porsche models available on any given day. The on-track experience is either 90 minute or two hours and runs between $385 to $1,300. For me it’s been a long time coming. 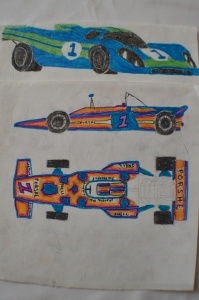 Recently digging through a box of elementary school mementos in my attic, I came across drawings I’d done of Porsche race-cars back in the day when Paul Newman and Steve McQueen were racing the German speedsters at Le Mans. And much to my delight, the car that had served as my model — a 240-mile-per hour Gulf Porsche 917K — was on display in the lobby. Instant nostalgia rush. Not nearly as much of a thrill as I’m about to have. We start with the low friction circle, water-slick surface where Kanavas teaches me how to brake, accelerate and steer my way out an uncontrolled slide into a smooth sideways Tokyo drift. Then it’s on to a computer-controlled hydraulic plate that kicks your vehicle sideways — and into a spin — on a wet surface. The one that stumps me is the ice hill, a seven-percent slope around an almost hairpin turn which simulates driving on a super-dangerous icy or snowy roadway. But even so, it’s fun doing 360 spins in the 911. Then its on to the handling circuit, designed not as a race course per se but an undulating country road where you can push the Porsche to its limits. 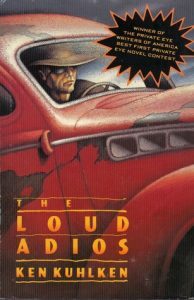 But you’re not out there alone — the adrenalin factor shifts into overdrive when there are other drivers making their way around the track at the same time. But that’s what I actually like most about the driving experience. “You love chasing those rabbits,” says Kanavas. And indeed I do, a chance to not only master the road course and my own Porsche, but to run down, come bumper-to-bumper and eventually pass other drivers trying to do the same. It’s addictive . . . and I can hardly tear myself away as the 90 minutes are winding down. But I want to take one last shot at the acceleration track. Running right beside the 405 freeway, the three-quarter mile straightaway ends in the famous Carousel loop at the Nürburgring racetrack in Germany. Shifting the car into Sport mode, I use both feet to fully depress both gas and brake pedals at the same time. Releasing the brake, the Carrera takes off like a rocket, the G forces hurling me back into the seat. It takes just eight seconds to reach 105 miles per hour . . . right beside all of those folks stuck in stop-and-go traffic on the 405. Historic cars on display in the lobby of the Porsche Experience Center. The 24 Hours of Le Mans veteran Gulf Porsche 917K is on the far left. 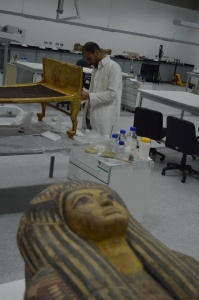 Photo courtesy PEC. The post World’s Most Delicious Museum? 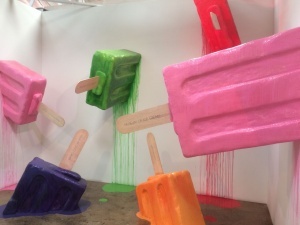 LA’s Ode to Ice Cream appeared first on Joe Yogerst. As much as I love ice cream, I was more than a little dubious when someone suggested that I book tickets — months in advance — for the Museum of Ice Cream (MoIC) in Los Angeles. 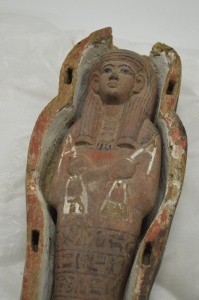 First of all, it’s a newfangled “pop up” museum rather than a permanent collection. The joint closes in December — although this is the fifth time its termination has been extended due to mass popularity. As a lifelong connoisseur of museums, it also got me wondering what an ice cream museum could possibly be. Either below freezing or a place where the exhibits are melting. But I gotta say it won me over from the moment I stepped through the front door (or rather than back door, because the entrance is actually via a graffiti-spangled alley behind the museum). I expected a kitschy, corny, campy collection. And that’s exactly what the whole thing is. But that very cheesiness is what makes the Museum of Ice Cream so delicious. Sort of like the first time you glide through “Small World” at Disneyland, you’re immediately sucked in by the bright colors, offbeat shapes and sizes, the retro sound track (60 pop and 70s funk), and the absolute joy on everyone’s face. And did I mention ice cream? True to its name, they ice cream at the Museum of Ice Cream. In cones and cups. And not only that, but Dove chocolates, genuine Gummy Bears, licorice and other sweets you can either eat on or with ice cream. Each room has a different theme — chocolate, bananas, mint and so on. 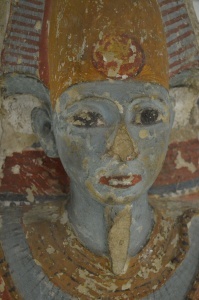 While it’s all about fun and flavors, here and there the museum drops informative little tidbits. Did you know February 19th is National Chocolate Mint Day? Or that Oregon, Washington and Idaho are the nation’s top mint-producing states? The museum’s crème de la crème (pun intended) is a swimming pool filled with sugary, multi-colored sprinkles. While diving may be discouraged, you can backstroke, butterfly or dog paddle through a sea of sprinkles. Which will be falling out of your socks and underwear for hours afterward. MoIC is the brainchild of Laguna Beach native Maryellis Bunn — who New York magazine called the “Millennial Walt Disney” — and Wall Street veteran Manish Vora. It may not be that vital to human existence. But since the first version opened in New York City last year, the collection has become a pop culture phenomenon. Celebrities have flocked to the museum, many with their kids in tow. Katy Perry and Kim Kardashian. Drew Barrymore and Gwyneth Paltrow. Jay-Z and Beyoncé. On the day I visited — at the exact time — basketball superstar Steph Curry was taking his family through the Museum of Ice Cream in San Francisco. 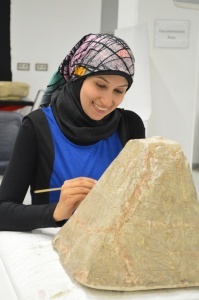 The next reincarnation of MoIC is scheduled to open in Miami later this year. And the organizers promise that other cities will be soon be blessed with their own versions. 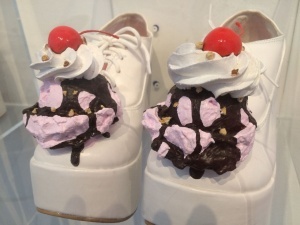 Given the attention the museum has garnered from press and public — and the amount of money they’re raking in — the Museum of Ice Cream no doubt heralds an age of numerous pop-up museums with different themes. I may have been skeptical before getting my first taste of this 21st-century entertainment form. But I’m ready to savor all sundry of future flavors. 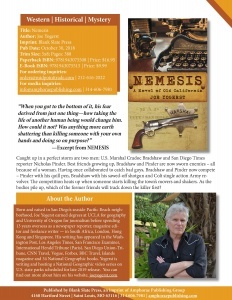 The post My new book Nemesis available for pre order! appeared first on Joe Yogerst. The post Craig and Joe’s Excellent Road Trips. Podcast One: Nearly Died Trying appeared first on Joe Yogerst. The post Pantanal — The Movie appeared first on Joe Yogerst. On par with Africa as a wildlife destination — and far better than the Amazon — the Pantanal is one of the world’s largest and richest wetlands. 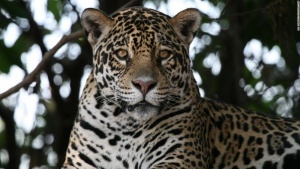 Located in the Mato Grosso region of southwest Brazil, the Pantanal is the best place on the planet to see (and photograph) jaguars in the wild.